TurboDrop Spray Nozzles - Rust Sales Inc.Rust Sales Inc.
Rust Sales, Inc. carries TurboDrop Spray Nozzles and sprayer tips. The TurboDrop® nozzle was developed in response to the market need for an agricultural spray nozzle that would provide a combination of canopy penetration and coverage with contact chemicals that was previously not available. TurboDrop® Nozzles are High End, Venturi Type – Low Drift Spray Nozzles for all spraying applications. The TurboDrop Asymmetrical DualFan is a revolutionary air injection nozzle design that allows spraying the target two to four times in one pass. The 10 degree forward spray pattern makes slightly smaller droplets than the 50 degree rearward spray pattern. Set up in the standard orientation on the spray boom, the forward spray covers the front side of the target and the rearward spray covers the back side. 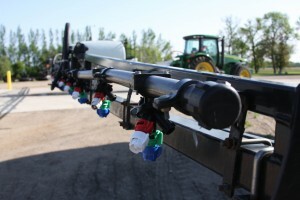 If every other nozzles is mounted “backwards” on the boom, the result is four distinct spray patterns delivered to the target. The two outer patterns (with the larger droplets) help shield the two inner patterns (with smaller droplets) from the wind. By spraying forward, backwards and down, the TurboDrop DualFan achieves a unique balance of coverage, penetration and drift control not previously possible with any other spray nozzle. In most sizes, the droplet spectrum is Medium-Coarse below 80 psi and Medium-Fine above 80 psi, making the DualFan nozzle extremely versatile. It can be used in drift-sensitive applications at 30-60+ psi and can be used for coverage-critical applications at 60-120 psi. The Low Drift TurboDrop® XL is an affordable polyacetal low pressure spray nozzle. The XL series is designed for 15-60 psi. It features a polyacetal venturi with an integal 110 degree tip/cap tip that can last up to 10,000 acres of spraying. The AirMix® is a compact, economic air injection nozzle designed to provide both drift control and surface coverage at conventional spray pressures. The Low Drift TurboDrop® Ceramic is a high end, mid range pressure sprayer nozzle. The Ceramic TurboDrop® Nozzle is designed for pressures from 40 – 100 psi. It features a ceramic venturi and ceramic 110 degree spray tip that can last up to 50,000 acres of spraying. The affordable polya cetal orifice in venturi determines flow rate. The pressure drop created by the venturi draws in air through the hole in the venturi. In the mixing chamber, the air and spray solution are blended and compressed. The air included in the spray liquid expands as it exits the pattern nozzle, additionally accelerating the drops. The air bubbles cause the drops to explode when they hit the target. Large drops become small droplets that provide optimum coverage for chemical efficacy.